The nights have started to get a little chilly in the Adirondack Mountains so I was inspired to make something a little more hardy than I have been making lately. Thanks to this wonderful food party I have many recipes to choose from. This dish was inspired by Becca's of Amuse your Bouche's Garlic Mushroom Macaroni and Cheese. I changed the cheese to mozzarella and made more of a béchamel sauce with white wine. Both versions are truly enjoyable. 1) Preheat oven to 400 degrees. Bring a large sauce pan of water to a boil with 2 tablespoons of salt in it for the pasta. 2) On medium-high heat melt half of the butter in a large skillet. Saute the onions, garlic, and mushrooms. Do not salt the mushrooms until they brown. Don't brown the garlic it will become bitter. 3) Remove the vegetables from the skillet and add the rest of the butter. Once the butter begins to brown slowly whisk in the flour and cook it until it begins to brown. 4) Turn the heat up to high and add the wine. Scrap the pan with a spatula while the wine reduces. Once this fond becomes syrupy add the milk and reduce the heat to medium. Whisk the milk until it incorporates with the fond. 5) When the water comes to a boil cook the pasta. While the pasta is cooking slowly whisk the cheese into the sauce. Once it is melted and mixed well add the nutmeg and vegetables. When the pasta is cooked mix that in too. Add salt and pepper. 6) Scoop pasta mixture into a large baking dish and sprinkle the top with a little Parmesan/Romano. Bake for 30 minutes or until the top starts to brown. Let the dish cool for 10 minutes before you serve it with a green salad. Still have too many tomatoes? This is your recipe. 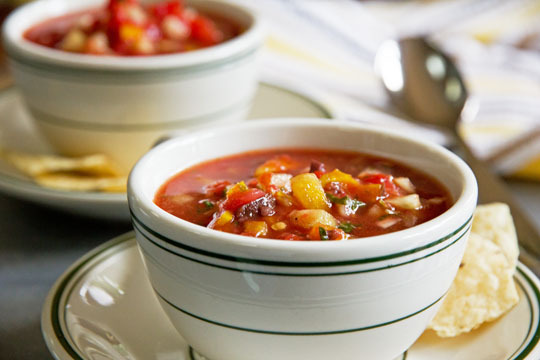 Plus you can add a whole bunch of other fresh veggies into this healthy delicious soup. Corn is still fresh and so available. With the nights starting to get a little cooler this soup is so satisfying. This is one of those dishes that reminds me that vegetarian cooking can be both simple and gourmet. This sauce is simple, yet so delicious, tastes like you worked for hours on it. This recipe includes one of the best tutorials on how to make this classic dish. Got Peaches? 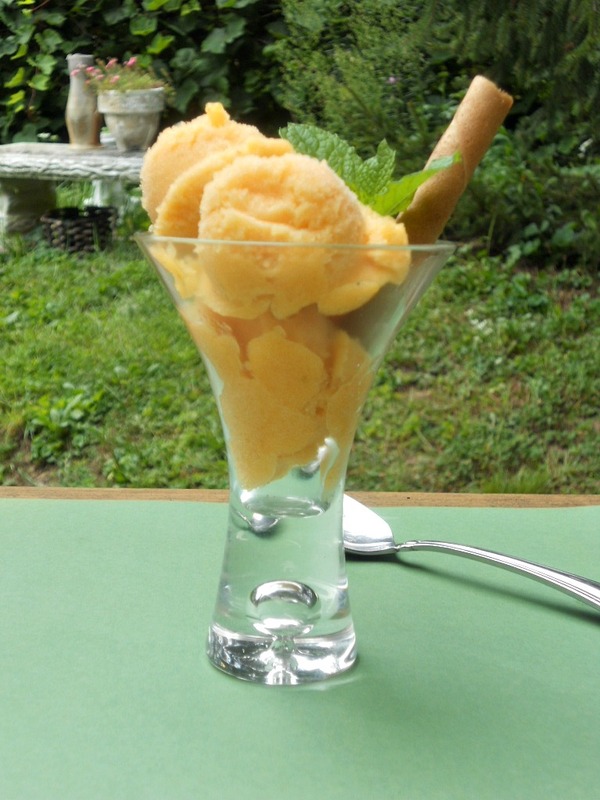 Get this sorbet... you don't need an ice cream maker, fantastic with a little ginger. I'm always impressed with how you change a dish up! I probably never would have thought to put mozzarella in it. We made a mac and cheese this week too, but I used a progresso sauce, and powdered cheese sauce. I love a good Kraft mac n cheese myself... brings me back to my college days. Thanks for the compliment this is really good. I hope you'll try it. That Chunky Gazpacho looks out of this world! I agree and so healthy too. Ours goes back and forth until Oct. We will still get warm days but cool nights. It is actually a lovely time of year. Diane - thanks so much for featuring my gazpacho! I just bought a bunch of tomatoes from the growers' market and am planning on making it again tomorrow! Love all of your featured recipes! Thanks for hosting and hope you have a wonderful weekend! You got up before me. I didn't get a chance to tell you. Really fabulous gazpacho. Oooh I'm glad my recipe inspired you! :) I love that you made it your own! Thank you... it is sincerest flattery I think when someone likes something of yours so much they make it your own. Yummy looking macaroni and cheese, with a twist. Thank you Diane for hosting. Have a great weekend! The Adirondacks must be beautiful this time of the year. Thanks so much for hosting, especially with your busy schedule. I've linked an easy version of Cherries Jubilee with French Lavender, served over toast. It is truly a beautiful time there. The leaves are incredible colors by the end of September. Thanks for sharing another delicious looking recipe. 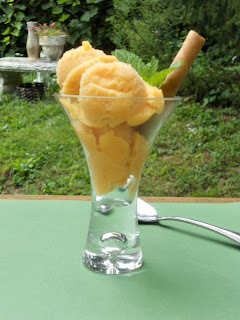 Thank you for featuring my ginger peach sorbet! Both Adelina and I are gaga over this sorbet. The flavors are just incredible. What a great twist on mac and cheese. Thanks so much for hosting Diane. Have a great weekend! I shared my Grain-free Salmon Rolls and an article about why going gluten-free is just not enough! Your Mac N Cheese looks awesome, it is the season. Hope you are enjoying some quiet time and thanks for hosting! Your Mac and Cheese looks delicious. I really like the addition of the mushrooms and all those lovely cheeses! Thank you for hosting, and have a lovely weekend. That Mac and Cheese looks AMAZING!!! Thanks for the invite today! Have a great weekend! I LOVE all the features!!! 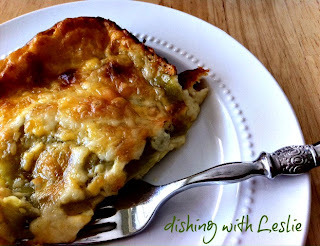 And thank you so much for featuring my Chile Relleno Casserole! I hope you have a lovely weekend! You Mac & Cheese sounds so good, btw! The mac and cheese looks yummy and hopefully now that it is cooling down, I will add this to my list! Have a great weekend! This mac and cheese looks amazing! My husband is Italian so pasta and the like make regular appearances at our table. Thanks again for the invite ~ I will enjoy following your blog. My heritage is all Italian. I need my pasta too. Are you fasting? If you are good luck. That macaroni and cheese looks sooooo yummy! Thank you SO MUCH for featuring me! It's always an honor! I love your blog!!! Thank you so much for the feature and for hosting another lovely party. 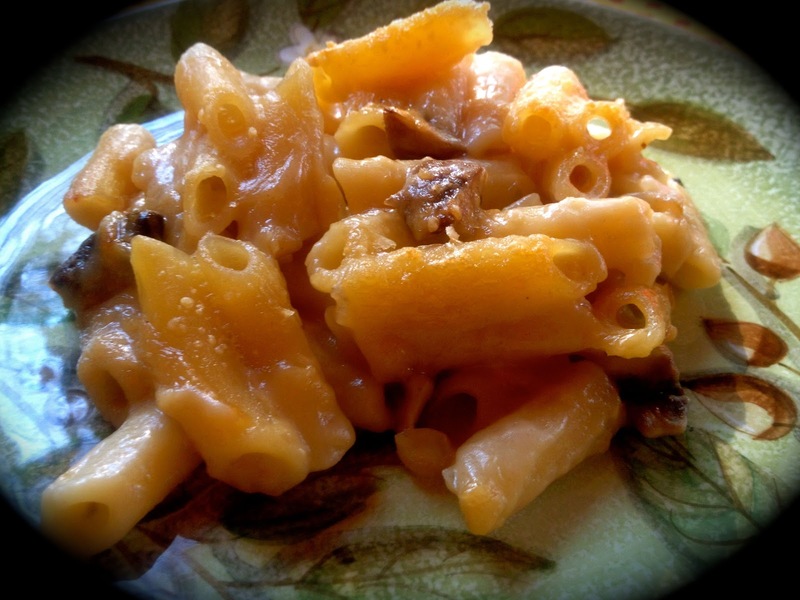 Your mac and cheese looks fabulous with mushrooms! 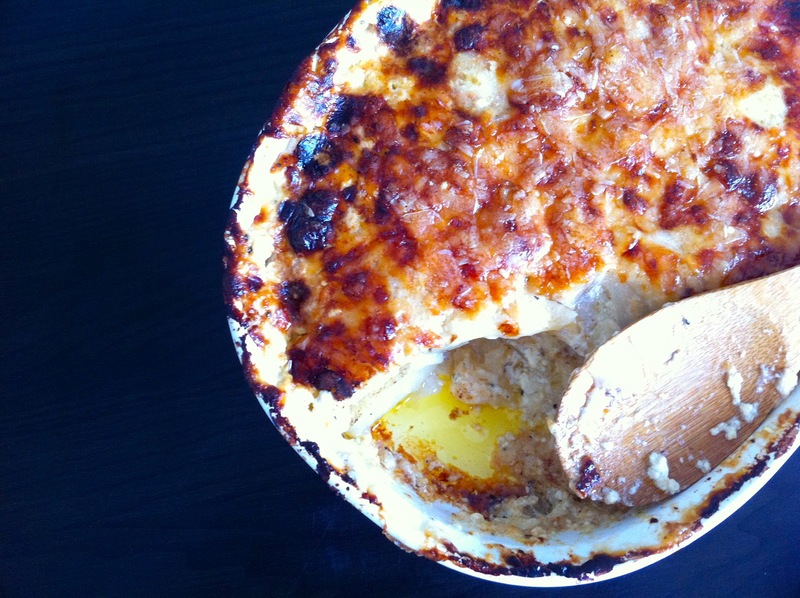 Thank you so much for featuring the Potatoes au Gratin recipe, Diane! I really appreciate the kind words. I also spotted MJ's Kitchen gazpacho soup - I love that recipe of hers and so happy to be included in her company! The pleasure is mine. Hope to see you back here again and again. That mac and cheese looks fantastic! Thanks for hosting and have a great weekend! Thanks for stopping and leaving a sweet comment. I was planning on coming over today! That Italian Mac & Cheese is a dish I have to try, mushrooms, white wine...that will warm you up! Thanks for hosting! Hope you have a great weekend! cheers! You are very welcome. Always good to see you. Thank you very much. I have been wheat free because of allergies so I really appreciate seeing your recipes every week. Hi Diane! Thank for stopping by my blog. I've linked up my Asparagus & Bacon Quiche. Hope your readers enjoy! I'm following you. Have a fab weekend! Terrific... hope to see more of your wonderful recipes. Thanks for visiting our blog and letting us know about Foodie Fridays! Thanks very much. I'm not usually on line Sundays but if I am I will link up. Thank you for inviting me to link up! I'm now a new subscriber to your blog, as well. :) Have a great day! Wonderful glad to have you. Hope to see you every week. Mmmmmmmmmmmmm that Italian mac and cheese looks delish!! Thanks for hosting and have a great weekend. Thanks so much for hosting Diane!! Have a great weekend!! Hi, thank for hosting I'm sharing Baked Buffalo Wings today. Have a great weekend. thanks for hosting and for inviting me to link up! Thanks for the invite to share my Caramel Apple Pound Cake, great recipes! 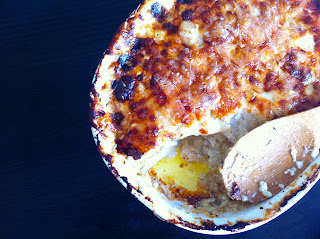 I'm always up for a new mac and cheese recipe-this looks delicious! This looks wonderful! Isn't it funny how something like this can instantly warm you up?! Thanks for sharing at Must Try Monday! That mac and cheese looks amazing! I'd love to get my daughter off her Kraft mac n cheese kick, and on to something tastier. 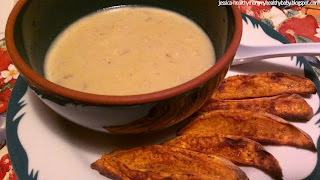 Love for you to link this recipe (and a couple others if you'd like!) to Wonderful Food Wednesday at http://www.athometake2.com. And if you could add us to your Wednesday Foodie links, that would be great as well. I'm updating my Linky list to include yours. Hope to see you there! Love your party. I was looking for some new food parties to join. 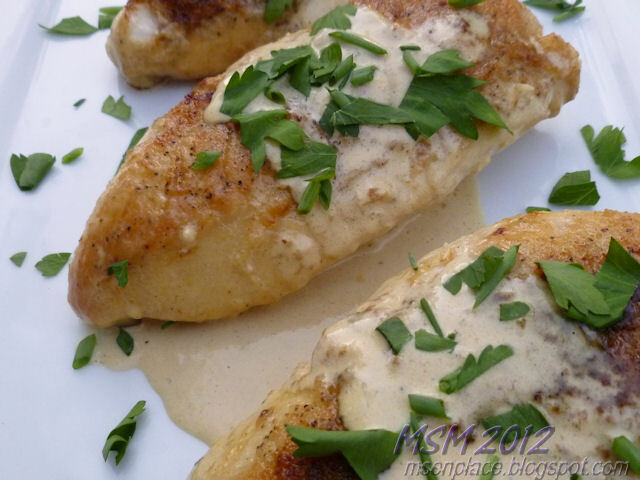 Diane, this is a wonderful recipe with lot of great flavor. Hope you are having a great week and thank you so much for sharing with Full Plate Thursday. This Italian Mac N Cheese looks delicious. Thank you so much for sharing with Wednesdays Adorned From Above Link Party last week.